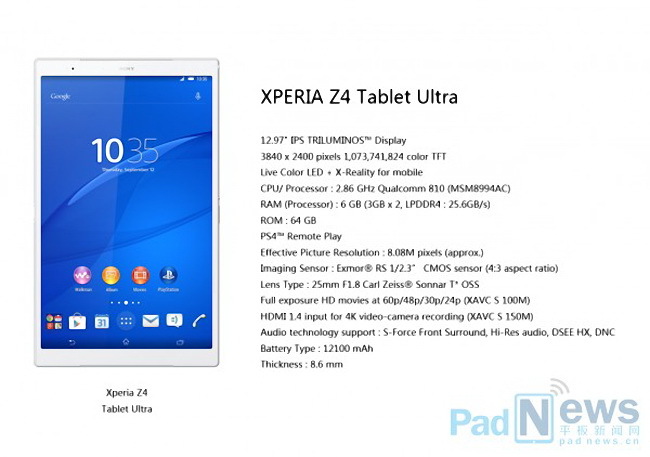 Sony is rumored to be working on a 12.9-inch tablet called the Xperia Z4 Tablet Ultra. The tablet is said to come with a very high-res display, fast internal hardware, and a price of roughly $1000. According to Taiwanese publication DigiTimes, Sony is working on a tablet with a 12.9-inch display, a premium device allegedly designed to compete against Apple's rumored iPad Pro. 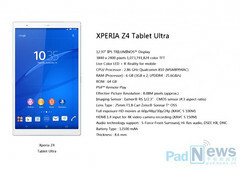 The Sony Xperia Z4 Tablet Ultra is said to arrive with a display running the insane resolution of 3840 by 2400 pixels. At the core of the tablet Sony will allegedly place a Qualcomm Snapdragon processor, although the exact model was not mentioned (the 64-bit octa-core Snapdragon 810 is our best guess at the moment). Previous rumors mentioned additional specs such as an 8MP primary camera, 64GB of integrated storage, a very large 12,100 mAh battery, and a whopping 6GB of RAM. Digitimes claims that the Sony Xperia Z4 Ultra will measure 8.6mm across its waist. We know that Sony can make thin tablets (the Xperia Z3 Tablet Compact is just 6.4mm thick), but the integration of a high-res display and a large battery were probably considered more important than extreme thinness. Digitimes says that Taiwanese contractor Pegatron already signed a deal with Sony to manufacture the tablet. Pegatron also makes the Microsoft Surface Pro 3, as well as the entire Apple iPad line-up. The new Sony Xperia Z4 Tablet Ultra is expected is said to be released at some point during 2015. The 2015 edition of the Mobile World Congress takes place in early March in Barcelona, and the giant tablet could well make an appearance there.